The example in that blog post simply returns static data, which was the easiest example that I could demonstrate. For this follow-up blog post, I will illustrate how to create a simple COM-based input format plug-in for Log Parser that you can use as a generic provider for consuming data in text-based log files. Please bear in mind that this is just an example to help developers get started writing their own COM-based input format providers; you might be able to accomplish some of what I will demonstrate in this blog post by using the built-in Log Parser functionality. That being said, this still seems like the best example to help developers get started because consuming data in text-based log files was the most-often-requested example that I received. In my earlier blog posts, I mentioned that a COM plug-in has to support several public methods. You can look at those blog posts when you get the chance, but it is a worthwhile endeavor for me to copy the following information from those blog posts since it is essential to understanding how the code sample in this blog post is supposed to work. OpenInput Opens your data source and sets up any initial environment settings. GetFieldCount Returns the number of fields that your plug-in will provide. GetFieldName Returns the name of a specified field. GetFieldType Returns the datatype of a specified field. GetValue Returns the value of a specified field. ReadRecord Reads the next record from your data source. CloseInput Closes your data source and cleans up any environment settings. In the preceding example, FOO is a data source that makes sense to your plug-in, and BAR is the COM class name for your plug-in. As I have done in my previous two blog posts about creating COM-based input format plug-ins, I'm going to demonstrate how to create a COM component by using a scriptlet since no compilation is required. This generic plug-in will parse any text-based log files where records are delimited by CRLF sequences and fields/columns are delimited by a separator that is defined as a constant in the code sample.
' Define the column separator in the log file.
' Define whether the first row contains column names.
' Define the field type constants.
' Indicate that no file has been opened.
' Open the input session.
' Return a status that the parameter is incorrect.
' Strip the single-quotes from the file name.
' Open the file system object.
' 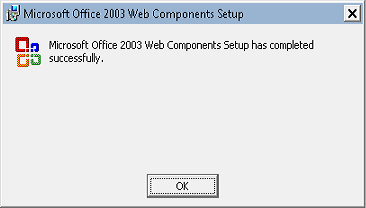 Verify that the specified file exists.
' Open the specified file.
' Set a flag to indicate that the specified file is open.
' Retrieve an initial record.
' Redimension the array of field names.
' Loop through the record fields.
' Test for a header row.
' Retrieve a second record.
' Redimension the array of field types.
' Test if the current field contains a date.
' Specify the field type as a timestamp.
' Test if the current field contains a number.
' Test if the current field contains a decimal.
' Specify the field type as a real number.
' Specify the field type as an integer.
' Test if the current field is null.
' Specify the field type as NULL.
' Test if the current field is empty.
' Otherwise, assume it's a string.
' Specify the field type as a string.
' Temporarily close the log file.
' Re-open the specified file.
' Skip the first row.
' Return a file not found status.
' Close the input session.
' Set a flag to indicate that the specified file is closed.
' Return the count of fields.
' Specify the default value.
' Test if a file is open.
' Test for the number of field names.
' Return the specified field's name.
' Test if the index is valid.
' Return the specified field name.
' Return the specified field's type.
' Return the specified field type.
' Return the specified field's value.
' Return the specified field value based on the field type.
' Read the next record, and return true or false if there is more data.
' Test if there is more data.
' Flag the log file as having no more data.
' Read the current record.
' Flag the log file as having more data to process. Next, let's analyze what this sample does. The <implements> section declares the public methods that the COM plug-in has to support. The strSeparator constant defines the delimiter that is used to separate the data between fields/columns in a text-based log file. If set to True, the plug-in will use the data in the first line of the log file to name the fields/columns. If set to False, the plug-in will define generic field/column names like "Field1", "Field2", etc. Locates and opens the log file that you specify in your SQL statement, or returns an error if the log file cannot be found. Determines the number, names, and data types of fields/columns in the log file. The CloseInput() method cleans up the session by closing the log file and destroying objects. The GetFieldCount() method returns the number of fields/columns in the log file. The GetFieldName() method returns the name of a field/column in the log file. The GetFieldType() method returns the data type of a field/column in the log file. As a reminder, Log Parser supports the following five data types for COM plug-ins: TYPE_INTEGER, TYPE_REAL, TYPE_STRING, TYPE_TIMESTAMP, and TYPE_NULL. The GetValue() method returns the data value of a field/column in the log file. The ReadRecord() method moves to the next line in the log file. This method returns True if there is additional data to read, or False when the end of data is reached. Next, let's look at how to use the sample. In this example, the data is pretty easy to understand - the first row contains the list of field/column names, and the fields/columns are separated by the pipe ("|") character throughout the log file. That being said, you could easily change my sample code to use a different delimiter that your custom log files use. With that in mind, let's look at some Log Parser examples. While the above example works a good proof-of-concept for functionality, it's not overly useful, so let's look at additional examples. This example reformats the dates and prices a little nicer, and it truncates the book titles at 20 characters so they fit a little better on some screens. 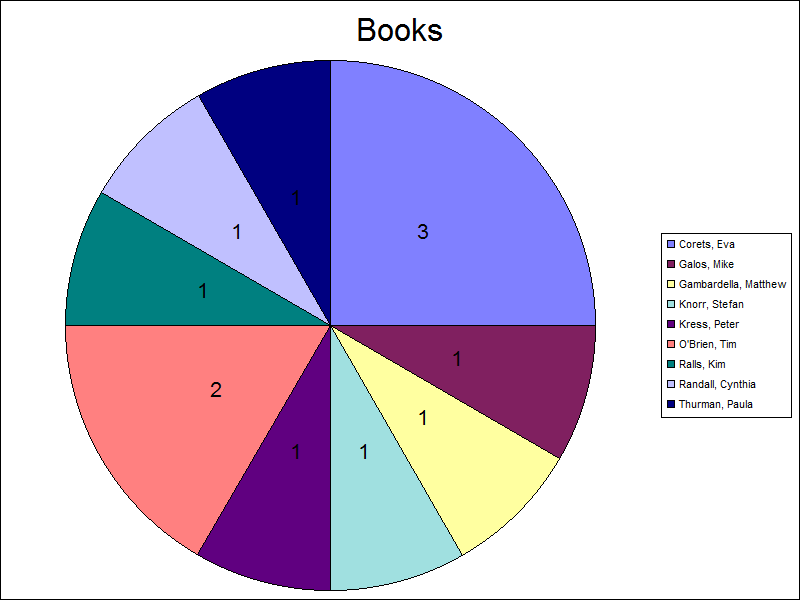 The results are pretty straight-forward: Log Parser parses the data and presents you with a list of alphabetized authors and the total number of books that were written by each author. I admit that it's not a very pretty-looking chart - you can look at the other posts in my Log Parser series for some examples about making Log Parser charts more interesting. In this blog post and my last post, I have illustrated a few examples that should help developers get started writing their own custom input format plug-ins for Log Parser. As I mentioned in each of the blog posts where I have used scriptlets for the COM objects, I would typically use C# or C++ to create a COM component, but using a scriptlet is much easier for demos because it doesn't require installing Visual Studio and compiling a DLL. logparser.exe "SELECT id,publish_date,author,title,price INTO books.log FROM books.xml" -i:xml -o:tsv -headers:ON -oSeparator:"|"
I hope these past few blog posts help you to get started writing your own custom input format plug-ins for Log Parser. With that in mind, I thought that I would write a couple of blog posts with simpler examples to help anyone who wants to get started writing custom input formats for Log Parser. The CloseInput() method would normally clean up your session, (e.g. close a data file or database, etc. ), but it doesn't do anything in this example. The GetFieldCount() method returns the number of data fields in each record of your data, which is static in this example. The GetFieldName() method returns the name of a field that is passed to the method as a number; the names are static in this example. The GetFieldType() method returns the data type of a field that is passed to the method as a number, which are statically-defined in this example. As a reminder, Log Parser supports the following five data types for COM plug-ins: TYPE_INTEGER, TYPE_REAL, TYPE_STRING, TYPE_TIMESTAMP, and TYPE_NULL. The GetValue() method returns the data value of a field that is passed to the method as a number. Once again, the data values are statically-defined in this example. The ReadRecord() method moves to the next record in your data set; this method returns True if there is data to read, or False when the end of data is reached. In this example, the method increments the record counter and sets the status based on whether the maximum number of records has been reached. That wraps up the simplest example that I could put together of a COM-based input provider for Log Parser. In my next blog, I'll show how to create a generic COM-based input provider for Log Parser that you can use to parse text-based log files. I'm going to recycle some of the FTP RSCA concepts from those blogs in order to create my COM plug-in. If you're like me, you already realize that the existing features of Log Parser simply rock. But what most people don't realize is that Log Parser lets you extend the functionality by adding new input formats, so you can consume the data from any place where you feel compelled to sit down and write your own Log Parser module. COM: provides an interface to Custom Input Format COM plug-ins. This last input format, COM, is how you interface with Log Parser in order to create your own input formats. When you install Log Parser, there are a few COM-based samples in the Log Parser directory, and you can take a look at those when you get the chance. In this example, FOO is some data source that makes sense to your plug-in, and BAR is the COM class name for your plug-in. I'm going to demonstrate how to create a COM component as a scriptlet, and then I'll call that from Log Parser to process the data. I chose to use a scriptlet for this demo because they are quick to design and they're easily portable. Since no compilation is required, updates take place on the fly. All of that being said, if I were writing a real COM plug-in for Log Parser, I would use C# or C++. Description="FTP RSCA for Log Parser Scriptlet"
' Open an input session that reads FTP RSCA data and stores it in a dictionary object.
' Return the current UTC date/time. Right("0" & Second(dtmUtc),2) & ".000Z"
' Return an element's position in a collection.
' Define a generic class for holding session data. Next, we'll analyze what the scriptlet does. The <registration> section of the scriptlet sets up the COM registration information; you'll notice the COM component class name and GUID, as well as version information and a general description. The first part of the script section declares the global variables that will be used. The CloseInput() method doesn't do much in this script, but your COM plug-ins may require more clean up depending on your data source. The GetFieldCount() method simply returns the number of data fields in each record of your data. The GetFieldName() method returns the name of a field that is passed to the method as a number. The GetValue() method returns the data value of a field that is passed to the method as a number. The ReadRecord() method moves to the next record in your data set; this method returns True if there is data to read, or False when the end of data is reached. The GetUtcDate() method returns the current date and time in Universal Coordinated Time (UTC) format. The FindElement() method locates a specified element's position within an IIS collection, or -1 if the element cannot be found. This method is used to determine the specified FTP site within the IIS configuration. The Session class is a generic construct to hold the information for a single FTP RSCA data record. This wraps up the description of how the scriptlet works as a COM plug-in, in the next part of my blog we'll look at how to actually use it. logparser "SELECT CASE UserName WHEN '' THEN 'anonymous' ELSE TO_LOWERCASE(UserName) END AS User,COUNT(*) AS Sessions INTO SessionCountByUser.gif FROM 1 GROUP BY User" -i:COM -iProgID:MSUtil.LogQuery.FtpRscaScriptlet -chartType:PieExploded -o:CHART -values:on -categories:off -legend:on -chartTitle:"User Sessions"
logparser "SELECT CASE UserName WHEN '' THEN 'Anonymous' ELSE 'Authenticated' END AS AuthType,COUNT(*) AS Sessions INTO AuthenticatedSessions.gif FROM 1 GROUP BY AuthType" -i:COM -iProgID:MSUtil.LogQuery.FtpRscaScriptlet -chartType:PieExploded -o:CHART -values:on -categories:off -legend:on -chartTitle:"Authenticated Sessions"
logparser "SELECT CASE UserName WHEN '' THEN 'anonymous' ELSE TO_LOWERCASE(UserName) END AS User,COUNT(*) AS Sessions INTO SessionCountByUser.gif FROM 1 GROUP BY User" -i:COM -iProgID:MSUtil.LogQuery.FtpRscaScriptlet -chartType:Column3D -o:CHART -values:on -legend:off -chartTitle:"User Sessions"
There's a lot more that we could do with this, but eventually I have to get some sleep, so I think that's enough fun for the day. In this blog post, I've shown you how to add your own custom input format to Log Parser by creating scriptlet as a COM plug-in. I hope that you take this information and create some great Log Parser plug-ins of your own. I recently had a situation where I wanted to customize the chart output from Log Parser, and after a bunch of research I eventually arrived at the conclusion that configuration scripts to create customized charts are probably the least-documented feature of Log Parser. After a lot of experimentation, (and a bit of frustration), I finally managed to achieve the results that I wanted. With that in mind, I thought that it would make a great blog series if I documented some of the settings that I used. Unfortunately, this sample isn't very useful, although I found dozens of forum posts that quote this sample as a way to do things - but it's the only sample that most people cite. The Log Parser help file mentions looking at the MSDN ChartSpace Object Model documentation, but that documentation is only slightly more useful. These two references are what led me to my earlier conclusion that chart configuration scripts are not well-documented, and especially when you are trying to do something with Log Parser. What I found to be particularly helpful was to use the Log Parser COM interface and write scripts by using Adersoft's VbsEdit and JsEdit. In case you haven't used either of those applications, they are great IDEs for writing scripts; they both give you a great debugging environment, and they have a great object browser that I used to discover what options were available to me. In the end, these two editors made it possible to create the chart configuration scripts that I will discuss in this blog series. For the samples in this blog series, I will use Log Parser's COM interface and VBScript to create my charts, but this is not necessary; everything that I am documenting can be done from the command-line version of Log parser, and I'll give you some quick examples to see the differences. Taking a look at this chart makes it easy to see why you would want to customize your output; that light blue is pretty awful, and those values are pretty hard to read. Yup - that's a pretty useless sample configuration script for chart customization. In my subsequent posts, I'll show how to make this chart (and several other types of charts) look a lot better. Around a year ago I wrote a blog entry titled "Converting NCSA log files to W3C format", which showed how to use the MSWC.IISLog object to convert log files in the NCSA format back to W3C format. I wrote that blog entry to make up for the fact that the CONVLOG.EXE utility only converts log files to NCSA format, which some older log analysis software packages require. So what happens if you have a bunch of log files in W3C format and you don't have a copy of CONVLOG.EXE on your computer? 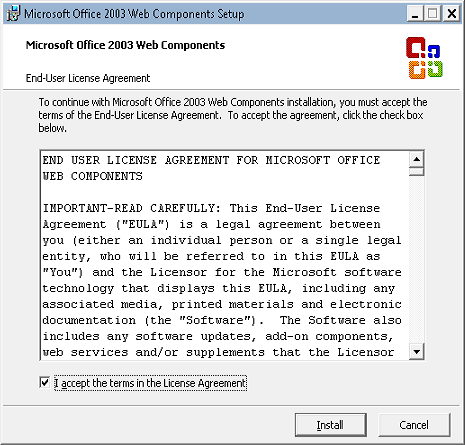 Version 2.2 and 2.0: http://www.microsoft.com/download, search for "Log Parser"
Version 2.1: http://www.microsoft.com/download, search for "IIS 6.0 Resource Kit Tools"
Once you've downloaded and installed the LogParser package, you will need to manually register the LogParser.dll file in order to use the MSUtil.LogQuery object. Having done so, you can use the Windows Script Host (WSH) code in this blog article to convert a folder filled with W3C log files to NCSA format. To use this code, just copy the code into notepad, and save it with a ".vbs" file extension on your system. To run it, copy the script to a folder that contains your W3C log files, (named "ex*.log"), then double-click it. strLogRecord = strLogRecord & " HTTP/1.0"""
strLogRecord = strLogRecord & " " & strLogTemp & """"